If you are a service or a product based company, you'd know how difficult it sometimes gets to manage our social media accounts. Being in content marketing genre, I've been writing for so many companies and managing up their social media accounts when my account was blank and not getting updated. It sounds both awkward and ironical! Not only for me, but there are also thousands (if not millions) of companies like this who aren't able to manage their social media accounts effectively due to reason or another. Well, if you are one of those who aren't able to leverage the power of social media effectively, you might want to try this service. The prime aim of 99 dollar social since its foundation is to provide custom social media services & solutions for small and mid-sized businesses. The company promises its rates to be very budget friendly and timely. 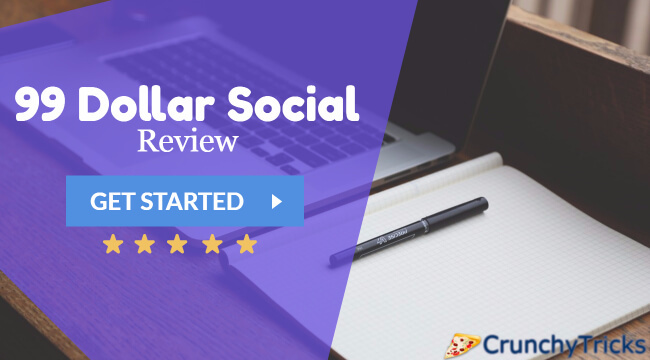 The main spotlight is its $99 package which can save a lot of time for business owners that they might take to manage various social media accounts. The company came to business in 2011 and since has been growing rapidly by serving tons of small sized business around the world. The company was founded in Arizona, and the majority of the team is based there too. As of now, the company doesn't outsource to other nations. This translates to the fact that all the accounts are managed by a specialist who specializes in conducting researches to determine what would be the best approach for social media channel for business. The company's prime customers are the small business that doesn't either have the time or either the expertise to engage regularly with their customer base. The organization provides posts that can be updated on social media websites such as Twitter, Facebook, and Google+. They work in a very impressive manner to provide customized content for that particular business. The best part about their working is that they don’t outsource the work like most of the agencies, all of the work is done in the agency itself by trained and dedicated content specialists who are quite experts in managing the social media content. The guys usually spend hours and hours on searching the internet for some engaging and relevant content for the audience that you have. The aim of these managers is to find content that would help you to engage your audience in the way you want. The dedicated content managers won’t just be posting anything on your social media channels. Once you place the order, the guys would begin to research for the industry you are in, the competition that you have and what is your target audience. This is indeed the key to doing perfect writing on social media; writing after doing a deep research. The company believes in earning your business and trust month after month; thereby they don’t put any contract for the whole process. Enterprises and users can cancel anytime when they like. However, the company is quite confident that once you use their services, you would love to stick with them for quite a long time. The company also offers a unique and excellent reseller which you can use to make easy money. The company offers the social media writing services at a rate of $99 (pretty obvious from the name itself ), but you can provide the same service at a rate higher than this and make money by promoting their services. With more and more business realizing the benefits of social media, these sort of services are high in demand and therefore make a great deal. I would recommend this service not only to small businesses but also to bloggers and influencers who can take part in their reseller program and make a real income by promoting their services and their own. If this was not enough, the company also provides an affiliate program where you can earn 10% flat for promoting their services.